wow those are great :) they look so colourful and fun! I'm going to try this out thanks! Seriously, you should open an etsy store! 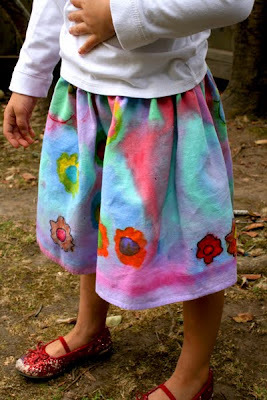 I LOVE what your kids made, the skirt is wonderful. And only four legs, well that's plain lazy. I'm not sure I've ever posted a comment, but I am a very big fan of your blog. Every once in a while I get to thinking the kids ought to do things a certain way, and you always bring me back to reality. 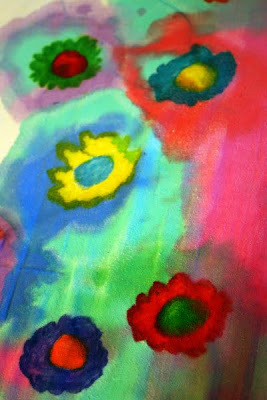 We tried tie dying with concentrated kool-aid a couple years ago, and every single speck of color washed out. 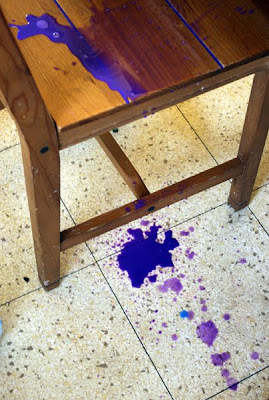 I later found out the kool-aid only works as a dye on animal based fibers. I was thinking, as I saw your skirts hanging to dry, that I might let my kids make us some new curtains for the kitchen. The colors coming through the fabric are great. I have been on a crafting hiatus for some odd reason, but this might get me back into the swing of things. Your girls are so creative, I love their art work! I don't think I've commented before but I've been reading for a while. I LOVE this. I think I'm going to make a skirt for ME. 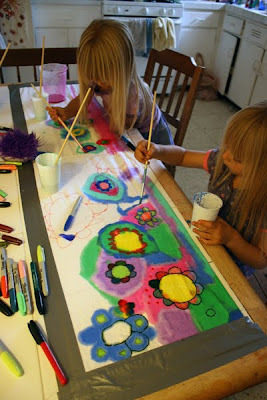 I can't wait until my kids are a little older and I can do some of your fun projects with them! Your daughter has the same shoes my daughter was wearing last summer, and hers were all white in front too. I found a glossy orange-red nail polish in my stash of unused cosmetics, and painted them every couple of weeks. Looked almost good as new. OOh, thanks for the tip Kirsten! She's wearing them all the time because of the wizard of oz fettish. I don't have any nail polish, but I'm sure going to get some from the Dollar Store for this. She'll be very happy to have them nice and red in the front again! Thanks for the heads up on the Kool Aid only working with animal fibres too Cricket. I have no idea about that stuff because we never had Kool Aid in the UK when I was growing up. I've heard of people using it to dye wool though, so that makes sense. Glad to see people wanting to give this one a whirl. it was dead simple and the kids loved having free reign to decorate it however. 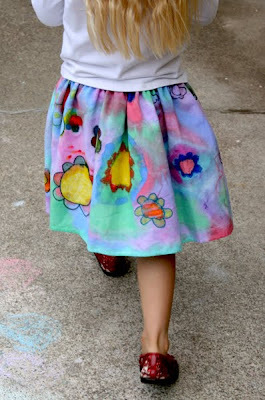 What a brilliant idea and the skirt ended up looking so beutiful too. I think i'm going to have to copy you aswell. A tip for you, cut you brushes shorter, and they will be less likely to tip the pot over...or use a muffin tray as a stand for the paint pots. Oh thank you so much for doing a brilliant dollar store craft for me to post about later this week! This one is really fabulous. I heard blogher is going to be in San Diego next August (2011)... going? Those are adorable. Well done ladies. That is one beautiful skirt. I think I'd like to try it but I don't sew. I love how this turned out! Brilliant idea! Gorgeous! We made one for my daughter today (tall 6 year old, so we still needed two dish towels, but only so we could have the length and width we needed). I can't believe how beautiful the colors turn out for this project. Her drawing/painting just pops! Just have to iron it and hope, hope, hope it doesn't wash out. We took pics just in case, ha ha. Thanks for a great blog and the inspiration to let kids out of their box. The skirt is gorgeous. 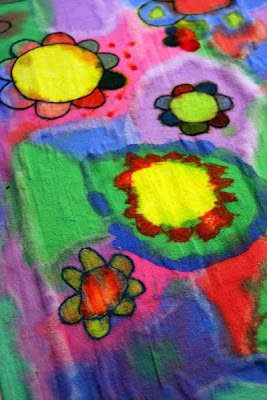 My kids have been making marker and paint pictures on paper similar to this, and I'm sure they'd adore switching to fabric. Wonder if I can get some paint to turn out masculine and not too pastel for the boy? really pretty! it is amazing how well the color stayed. i love how it turned out! This is a great idea! Your girls has done a fabulous job. How neat it is for them to wear their creations. Gorgeous! My daughters would absolutely love to make these! Love it! 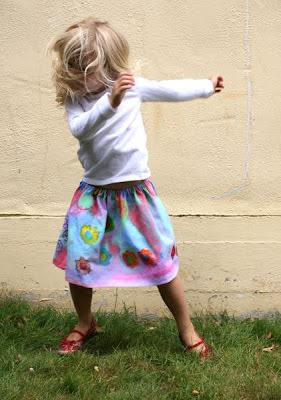 I'd like to wear that happy skirt! Hi, I'm here via crafty crow. My girl, 8, was right on the fabric design idea and has already detailed instructions for the shorts she wants me to make her. I'm just waiting for the dish towels that were left over from a teacher present project to be washed and dried. On looking through old posts, I happened on the land of oz with the batman lion-person. LMAO, can I be your friend? Better yet, can I just come live at your house? The girl and I have lots of ideas, and lots of art and craft supplies, so we wouldn't be too much trouble . . .
thanks for this very creative tutorial. 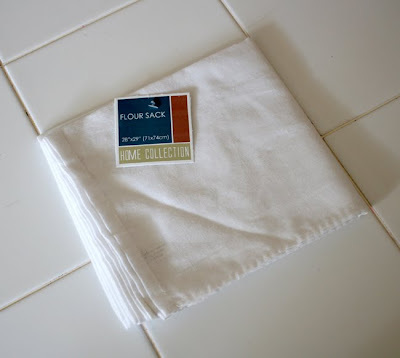 I bought some of those flour sack towels today, and they seem REALLY thin. You didn't double them up to make the skirt? Does the paint make it a bit more opaque? These are absolutely beautiful. Your daughters' creativity is inspiring. The pride they must feel when wearing their skirts. I'll be linking on Facebook. I am a beginner sewer and I think I could make this, if the instructions were more clear. Am I the only one, that doesn't really understand how to sew the top for elastic? Can anyone offer advice? LOVE this!! What a great idea for homemade holiday gifts for this year too:) I'll definitely be making one of these for myself this fall too! Love it! 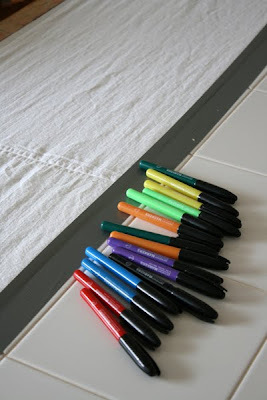 I'm going to make some of these with my boys- I think my oldest (4) would really like a pair of colorful lounge pants. Thanks for the inspiration! Wow! I just love this!!!!! I'm going to try it with my daughter this week. What a great idea! After seeing your post we are now thinking a fashion designer birthday party might be in order! so i just found your blog and LOVE LOVE LOVE your ideas!!! thank you! i live in the bay area too....if you haven't already, you need to check out the Adventure Playground in Berkeley....it's right up your alley!!! I have had this idea simmering since you posted it and today is the day! Can't wait to see what my 3 and 5 year old girls create. When I post tomorrow I will link back to you. Thanks for the great ideas! How have these washed? We did this with cotton t-shirts and sharpies early in the summer and most of it washed out. I'm perplexed. These are great ideas just in time for back to school outfits. My 9 year old daughter and here friends are having a back to school party and I think will be a great activity. Thanks for the fabulous creativity! Fantastic project. Thanks so much for sharing! OMGoodness! What a wonderful craft project...for both the itty-bitties and us grown-ups. I wish more parents would take the time to do creative stuff like this with their kids. You've proven time and time again that it doesn't have to cost an arm and a leg, can be loads of fun for everyone invvolved, and can also be educational in some way (just don't tell the kids.) :) Thanks for sharing all of your wonderful ideas with us. Thank you for such inspiration! My 4yo and 2yo have tried this on some calico today, and my plan is to sew some Christmas presents with the finished product. 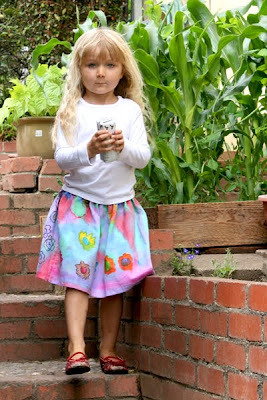 My 3 yo and I have made 2 skirts now using old and useless Gerber flat diapers. 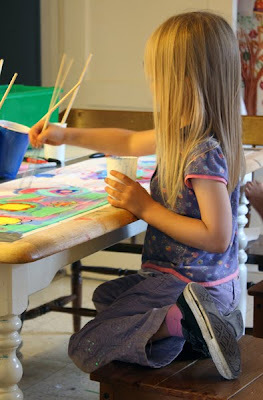 The 1st, we only had 1 color of paint that hadn't dried out, and we painted all around the hem, plus splattered it. It looked very boutique-y. The 2nd I drew some famous works of art and she painted them. First we masked off some things with tape and painted the cool colors. Blew it dry, and then masked some things, and then did the warm colors. Finished off by some strategic dumping of paint in various areas when she lost interest. They are fabulously not muddy and a big hit. Watered down acrylic paint! What fantastic idea! 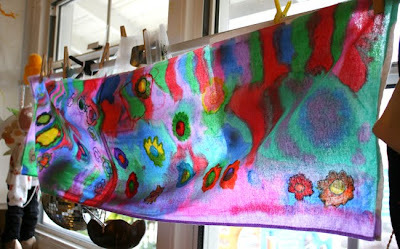 My son and I have done fabric paint(is that really just acrylic), but never thought of watering it down. I would like the effect much better. I love this! I've got a baby on the way and this looks like crazy amounts of fun, not just for kids either! I'm thinking I need to this for myself as well! I'm doing a craft shirt right now trying for the "batik" look and haven't been pleased, after reading this I realized it's because I haven't watered down the shirt enough! 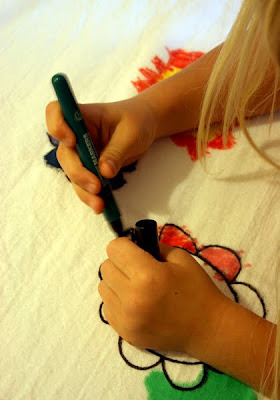 I'm going to try this with my 5 yr old it'll be a fun paint & sew project for her! I found this on pinterest. I love this. I am a long time painter and grandma and intend to have my grandchild and nieces and nephews over this summer to do this. I also love the idea of making summer curtains like this. Wonderful, pretty, and very expensive looking too! You have inspired me! Thank you! 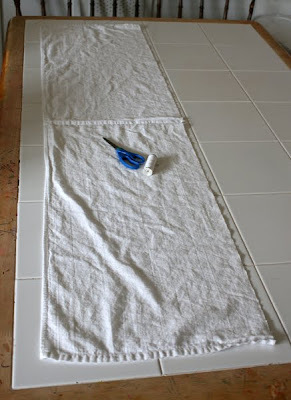 Hi, I love this idea but was wondering if it would work out as well on plain old white cotton fabric from the fabric store, or does it have to be a kitchen towel more absorbant type of fabric? Also, has this held up well with multiple washes? Thanks a bunch! thank you for sharing. i just want to say your children are so cute..what a nice family...Marcia from Modesto.